Preview for the hand made multilingual “goodbye” posts of the project “Partir c’est mourir un peu”. “Partir c’est mourir un peu” is the title of a wonderful “typographic” project that I accidentally saw on my way to the office in Hilversum. In a small neighborhood on the edge of the city, people have posted large goodbye posts outside their windows, in reaction to the fact that they will be leaving their apartments since the buildings will be destroyed and replaced with a new urban development plan. 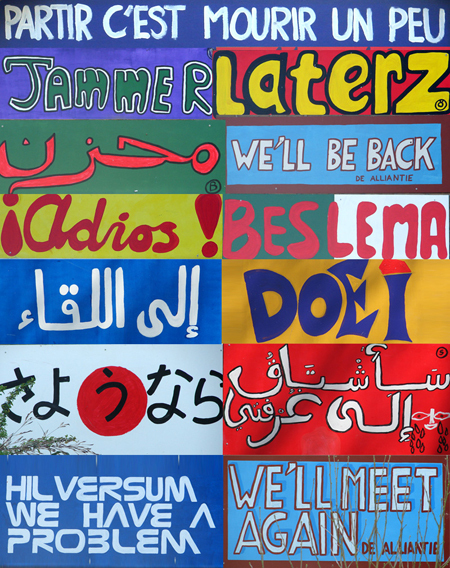 The multicultural aspect of the street resulted in multilingual signs, colorful, amateurish, yet with a beautiful authentic character. Probably the best “typographic “Adios” I have seen in a while!